Hurricane Harvey first struck Texas near the city of Rockport on August 24th. Harvey then pulled out and entered Texas again on the other side of Houston. Almost directly in the middle of each landfall is the town of Wharton, Texas. Most of the city of Wharton was covered in water during the historic flood that Harvey brought. I grew up in El Campo, 10 miles down the road from Wharton. Fortunately, my family escaped any major disaster, but the majority of the homes along the Colorado river did not. I wasn't able to visit the area until late September. By then, waters had receded, but Harvey's physical toll was clear. In a few low-laying areas were scenes of lost possessions, furniture, and gutted walls on the side of the road. 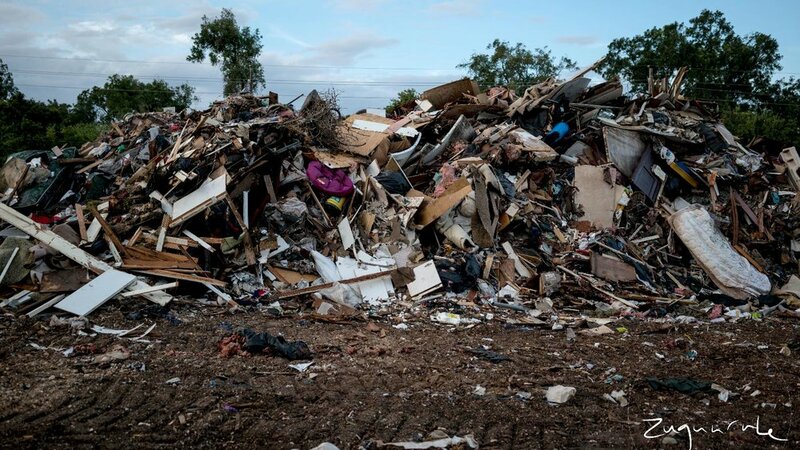 Heaps that had been there for an extended period since city trash collectors couldn't stop by. Driving by heap after heap, I began noticing the possessions making up these mounds. Things that I can't imagine anyone had planned to throw away. Parts of lives had to be thrown out because of a massive tragedy that no one could have ever expected. I noticed small pieces that stood out while looking around at the damage. So I began shooting portraits. Then I started seeing these collections as sculpture. Sculpture made with the most intimate of materials, shaped by tragedy. The materials were instruments of daily living. Stuffed animals that brought comfort, appliances and furniture, even sheet rock and entire walls torn up and stacked. The people shaping the forms were acting with little caution, going through the emotional toll of removing them from meaning. When you think of sculpture, you think of certain materials, for the most part devoid of context, chosen for their attributes. The sculptor with intent uses the materials to give them meaning. Here, the formations I saw were the inverse. From sandbags and mattresses, to toys and photo albums. These collections were people's lives, on display during their most vulnerable moments. Its not a nice thing to think about, but these are the most honest portrayals of possessions you will ever see. Damaged items, no longer of practical use, thrown to the side of the street. And how they were arranged displayed how they were being thought of in that moment. Some placed carefully to honor the memories connected, others haphazardly tossed and stacked. 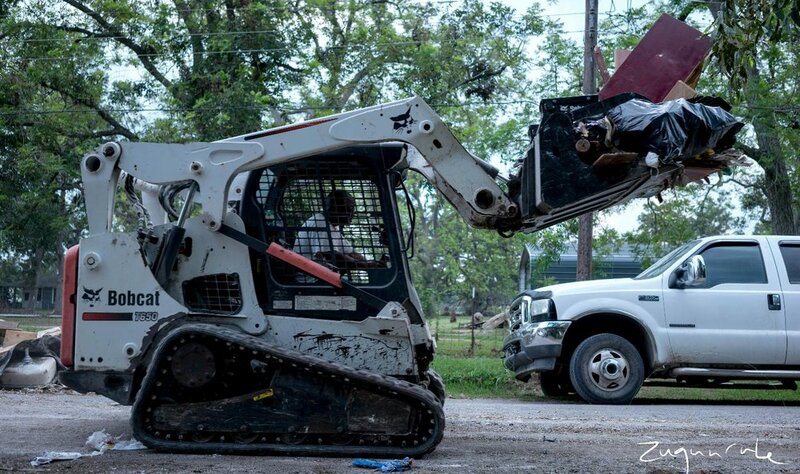 As bad as the damage was from Harvey, neighbors helped neighbors, communities came together, and workers came from nearby states to help clean up efforts. With every natural disaster and the havoc they bring, the humanity it brings out in people offers us a perspective that helps healing from the emotional toll. I’m absolutely floored by the way this flood has wiped out people’s homes. I don’t intend to benefit from this tragedy. I’ll be selling prints and 100% of profits will be donated to local organizations and churches helping people heal and build their lives again. Each print sold will also come with an extra print from my last gallery show for free. Requests will be honored if available. If you do not wish for a print but want to donate, please reach out and I can give you a list of places to send donations.